pH is a measurement of the hydrogen ion concentration in water. The pH of pool water affects the comfort of swimmers as well as pool maintenance. "pH" stands for "protens hydrogen" or "power of hydrogen." 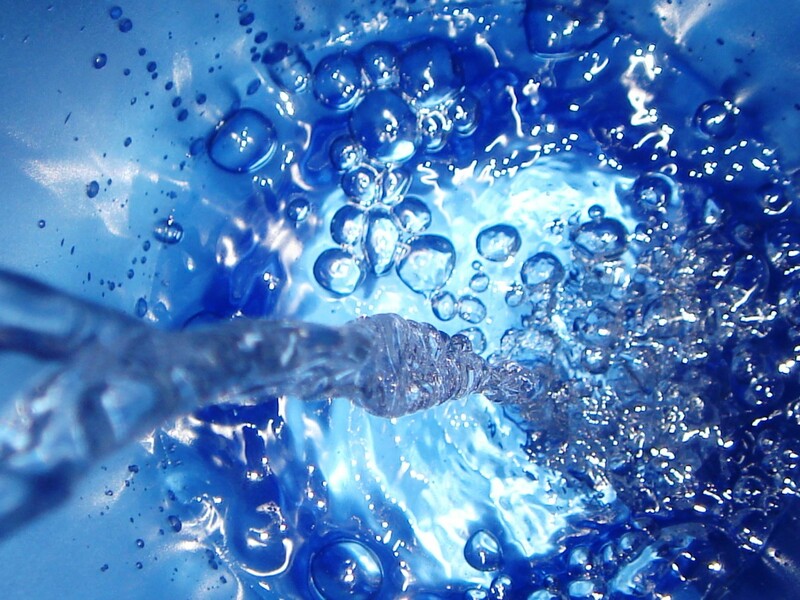 Water conducts electricity and is easily ionized, so it will always contain some level of hydrogen ions. The pH scale is exponential and is set up so that the smaller the pH number measured in the water (or any solution), the more acidic it is. The higher the pH, the more alkaline it is. Why Does pH Need to Be Balanced? Controlling the pH is important not only for comfortable swimming, but also for the long life of the materials that make up the pool. Considering that the pH of teardrops from a human eye is about 7.5, having a pH as close to that number as possible will make swimming more comfortable. As a pool service tech I sometimes hear people complain that swimmers' eyes hurt because the chlorine level is too high. But in these cases, an unbalanced pH level, not a high chlorine level, is almost always the problem. To lower the pH, the most common liquid acid used is muriatic acid, also known as hydrochloric acid. To raise the pH, soda ash (sodium carbonate) is normally used. Sodium bicarbonate (baking soda) can be used to raise pH if the alkalinity is low, but it’s more commonly used to raise alkalinity. Briefly, alkalinity refers to dissolved salts, like carbonates, that keep pH stable. If alkalinity is in the right range, pH and chlorine levels are easier to maintain. To lower alkalinity, add muriatic acid. Muriatic acid lowers both pH and alkalinity. To raise alkalinity, add sodium bicarbonate (baking soda). This is different from sodium carbonate (soda ash). This depends on just how high the pH is and the size of the pool. If you are using test strips, it's usually hard to determine exactly how high the pH level is; you just know it's high. A better test kit, or a DPD drop test kit, will use phenol red to give you a better idea of your true pH reading. Some better test kits include an "acid demand" test to help calculate a more precise dosage. If you have a pH reading of 7.8 or higher, and an average size (15,000 gallons) in-ground pool, you should add 1/4 gallon (a quart) of muriatic acid, and re-test after the water has circulated for an hour. If you have a smaller pool, or an above-ground pool, you would start with one cup of acid, and then re-test and add more if needed. If you have a spa, we are talking only capfuls at a time. Very little acid is needed to adjust pH in a spa. For a more exact idea of how much acid to add, see the table below, or see this pool calculator that will give you an amount based on estimated pool volume and chemistry. 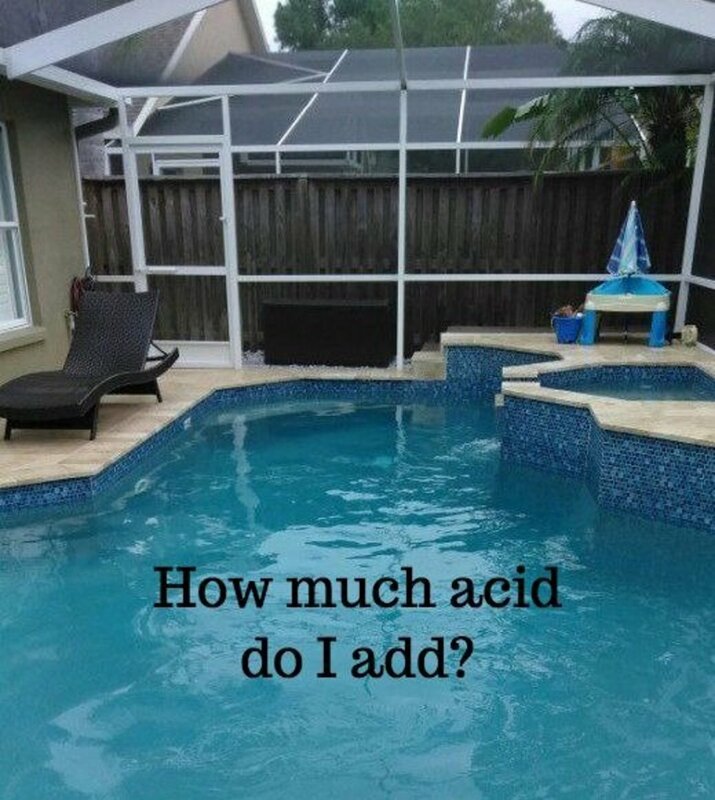 How much muriatic acid to add to your pool. Check the pH with a test kit or test strip and use the pool calculator (link above) to estimate your pool's volume in gallons. When you add acid, pour it into the deepest part of the pool, while the pump is running and circulating the water. Wait at least an hour before using the pool; if you added a lot of acid, wait 24 hours and test the pH before using the pool. My above ground pool has a pH of 8.4. It holds around 16500 gallons of water. I have used a gallon of muriatic acid and shocked the pool. It is still green, and the pH is still at 8.4. What should I do? If the pH is still 8.4 after adding a gallon of acid, there is a more severe chemistry issue. Also be sure that the test kit being used is giving accurate readings. 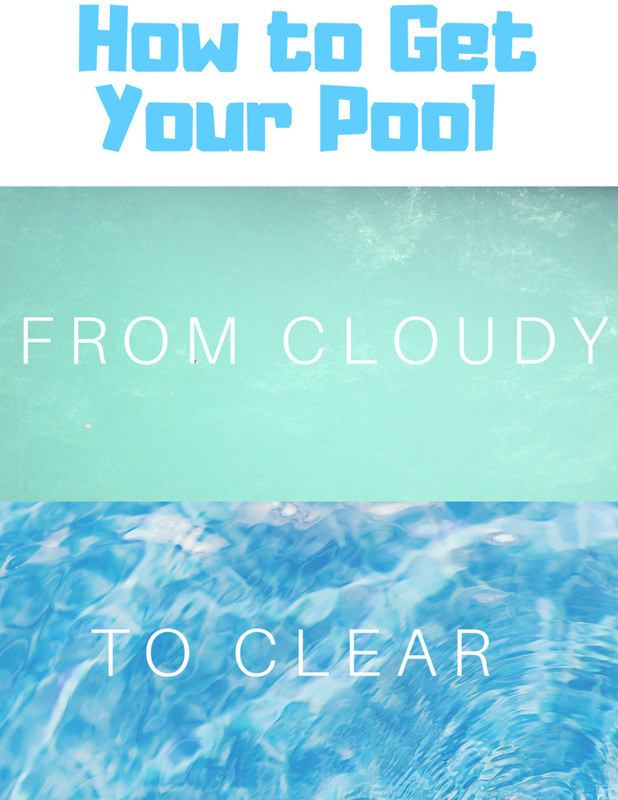 I would suggest brushing the pool and adding a floccing agent such as "Drop-Out" or "Drop-Down" which will sink all algae to the bottom of the pool. It will need to be then vacuumed to waste (this is sometimes difficult to accomplish with above ground pools). Some water will be lost during this process. After this is done, the water chemistry can then be re-balanced. If the pump/filtration system is not set up to vacuum to waste or "backwash," other options would be to keep the pH around 7.2, elevate the chlorine and filter out the algae cleaning the filter frequently. If all else fails, drain the pool and re-fill. Try this chemical dosage calculator to adjust chemicals. What do I do after adding too much shock to my pool? 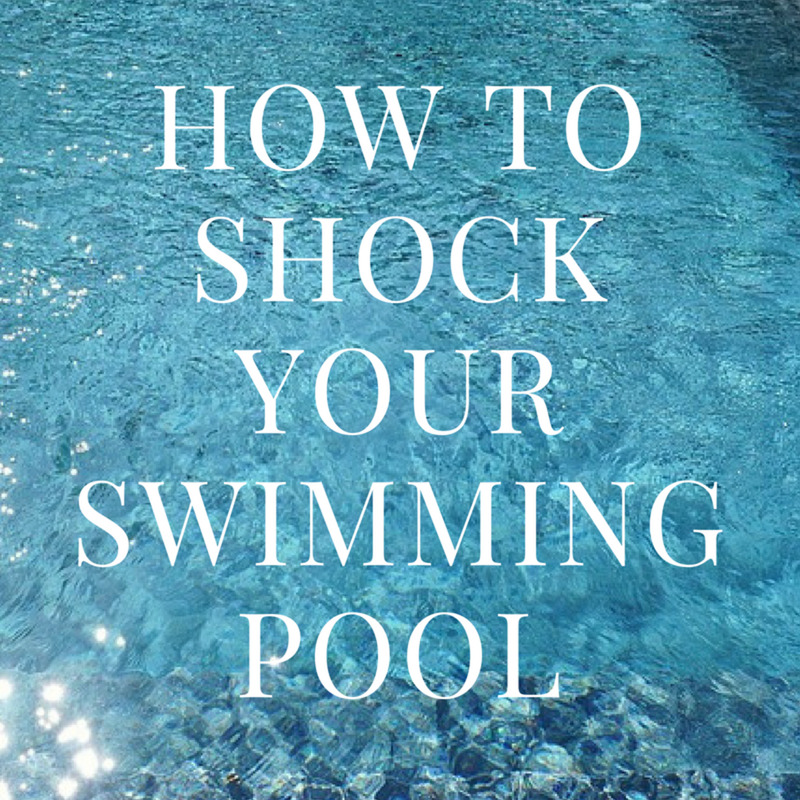 If you've added too much shock, then there's a risk of the chlorine level being dangerously high. To lower the chlorine level, you can approach this in two different ways. To lower it immediately, sodium thiosulfate can be used (sometimes called "After-shock" or simply known as chlorine reducer). The other option would be to wait several days and let the level come down on its own. My pool ph was 7.8 when tested at the local pool place. It called for 15 pounds of pH down. They sold me pH up, and it was added. It instantly turned pool water milky. They apologized and gave me one gallon of muriatic acid to add. It is still milky. How long does it take to work? Should I add another gallon? What else can I use besides muriatic acid to lower the pH of my pool? Sodium bi-sulfate can be used. This is dry acid, sometimes called "pH down"
What if I don't have a test kit for ph level? I'm tending to my sister's pool while she's out of town - I put a full gallon of muriatic acid in the pool like she said - but she didn't mention waiting, or testing. Is there a way to tell without a kit? Testing the pH is very important. There is no way of knowing the level without testing. The best advice I could give would be to at least purchase some cheap test strips. How can I lower the alkalinity level of my pool? Muriatic acid will lower the alkalinity. Keep in mind that it will lower the pH at the same time. If you have high alkalinity, usually the pH is also high although rarely I have seen high alkalinity and low pH. In this case, lower the alkalinity with muriatic acid and then bring the pH back up using sodium carbonate (soda ash, not to be confused with sodium bicarbonate which is used to raise alkalinity) Soda ash increases pH only without affecting alkalinity. What should the pH be for a 30,000-gallon inground pool? The pool size or gallon amount makes no difference. The pH level should be 7.4 to 7.6 in any pool. Should I test the pool water's pH with the filter turned off? It's better to test chemicals with the pump on and water circulating. Do I pour muriatic acid in the skimmer or directly into the pool? The acid should always be added directly to the pool, preferably near the deepest part of the pool with the pump running and water circulating. After adding the acid, allow at least 1 hour of circulation. Is sulfuric acid and Muriatic acid the same? No, although sulfuric acid can be used to lower pH, it's less commonly used as it has a high concentration of sulfates. Over time, combined with the calcium in the water, will cause damage to the pool surface. Muriatic acid had a strength of 31% where as sulfuric acid has a strength of 38%. Sulfuric acid is much more corrosive than muriatic acid. My pool has 164,853 gallons. How much HCL do I need to use? Can I add muriatic acid to a pool that has a liner over the cement? Will it affect the liner or melt it at all? All pools need to have pH adjusted. Muriatic acid is commonly used, but also dry acid. If you are adjusting the pH in a vinyl-lined pool using muriatic acid, add slowly to the deepest part of the pool with the pump on and water circulating. This will NOT harm the vinyl liner although unbalanced chemicals over time will have damaging effects. How do I raise the alkalinity of pool water? Sodium bi-carbonate (baking soda) will raise the alkalinity. 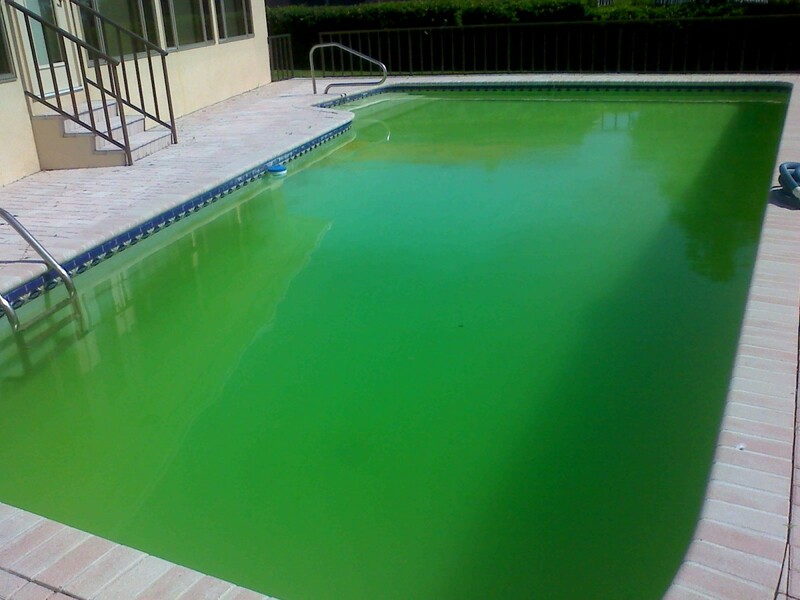 Do you need to dilute muriatic acid before adding it to a pool? No, as long as there is circulation in the pool (pump running). Add acid and allow it to dilute on its own and circulate. No need to "pre-dilute" when adding to the pool. What do I do when my pool pH is good and the alkalinity is high? The alkalinity in pool water should be no higher than 120. Because alkalinity tends to be a buffer for the pH, it's rare that I see high alkalinity and low to normal pH although it CAN happen. The alkalinity can be lowered using muriatic acid with the problem being that it also lowers the pH at the same time. The answer is to use both muriatic acid along with sodium CARBONATE also known as soda ash (Do not confuse with sodium BI-carbonate which raises alkalinity) Depending on how high the alkalinity is, add the desired amount of muriatic acid and let circulate for several hours. Once the alkalinity is within the desired range, you will use pH increaser (soda ash) to bring the pH back up without raising the alkalinity. Keep in mind that it doesn't take much soda ash to increase pH. I have a 30,000-gallon pool. The T/A is 120, and the pH is 8.0. I put in two quarts of muriatic acid, and I pump at 3,000 rpm for 15 minutes and then hold at 1,500. How long do I have to wait until I can swim in the pool? With two quarts of acid added to 30,000 gallons of water, it will be safe for you to swim in one hour. What am I doing wrong? I have a 20k gallon pool and have put in 2 quarts of muriatic acid because the pH and Ta are too high. 24 hours later, there is no change in my test numbers. How much sodium thiosulfate do I use to lower my chlorine level that is at 10 of my 35000-gallon pool? To bring the chlorine reading from 10ppm to 4pmm add 1.31 pounds of sodium thiosulfate to 35,000 gallons of water. You mentioned that a pH of 7.5 is most comfortable swimming. What is the optimal swimming Alkalinity? Alkalinity is best between 80 - 120 ppm. I usually strive for 90 to 100 for the best chemical balance. I have 62,000 gallons of water in my pool. How much acid is required for that many gallons of water? I can not answer this accurately without knowing what the current pH level is. An example would be for a 62,000-gallon pool, if the pH is 7.8 with an alkalinity level of 90, you would like the pH level to be 7.4 (ideally), so you would add approximately 88 oz., or 2.6 quarts of muriatic acid. A pool chemical dosage calculator can be used. Try this one.. I need to add 10oz of acid to my pool. How long must I wait to swim in it again? How do I lower the chlorine level of my 35000-gallon pool? Laura, Citric acid is not used to drop pH. I also can not recommend pH to be any lower than 7.4, Unless you are doing some sort of stain removal. Hi Patsy, thanks for reading! So the most common alkalinity increaser is sodium bicarbonate (baking soda) and yes, it can be used to raise pH as well. If you have high alkalinity and low pH, soda ash (sodium carbonate) is best. If both alkalinity AND pH is low, than sodium bicarbonate is ideal. 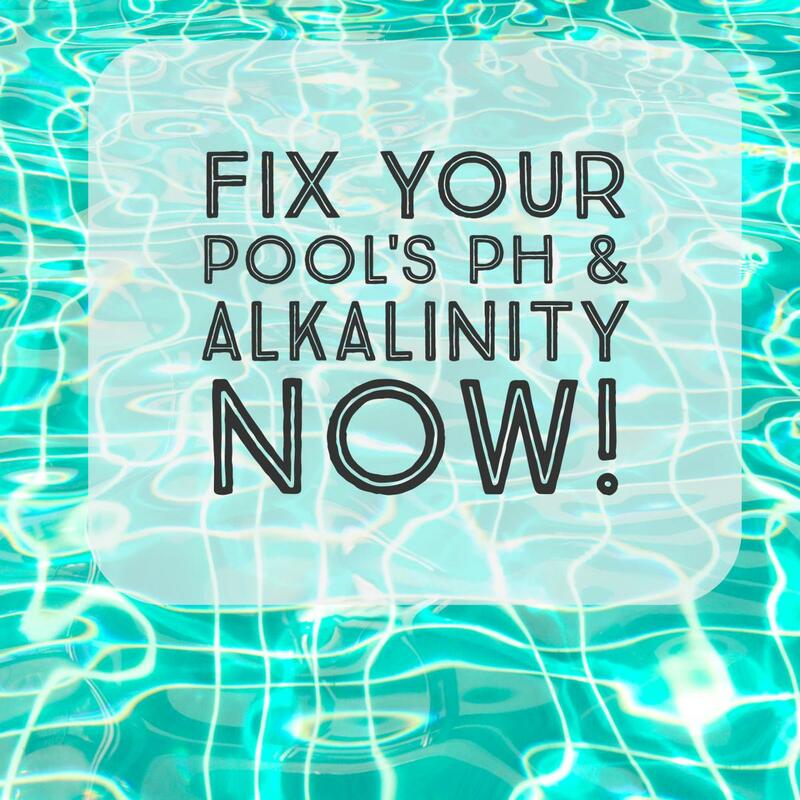 If my ph in my pool is too low could i add some total alkalinity to balance it? My above ground pool around the bottom ring is dark color - looks like rust. It feels grainy. Chlorine is 2/4, pH is 8.4, alkalinity is 40, hardness is 150 & cyanuric acid is 50. How can I get rid of the ring? ocpool...Thank you for your comment. This article addresses specifically pH. High chlorine can also be an issue. If you have started a pool company, it might be a good idea to brush up on pool chemistry knowledge. Hi we just started our own pool company and I had no idea pH is usually the problem and not high chlorine levels. This will really come in handy, thanks a lot! Chris, just make sure the pump is running when you add the muriatic acid, you can swim in 45 minutes. It doesn't take long for it to dilute.